Leduc Physio - Physical Therapy and Massage Therapy ServicesPhysiotherapyPainHappy New You! Happy New Year! 2018 is a New Year for a New You! and a 60 minute massage with one of our four massage therapists. 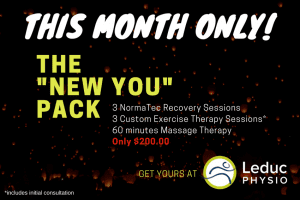 Call or stop by Leduc Physio to get the New You bundle today. Only available for the month of January!